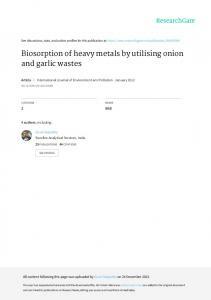 Dec 24, 2013 - sulphide compounds in onion and garlic wastes on a gas .... garlic wastes revealed the principal sulphides present as being: diallyl sulphide,. For improving gas and solid mixing efficiencies of the dual fluidized beds, a ... cm (w) X 7 cm (d) X 30 cm (h) and partitioned above the 7 cm of distributor. Air and. CO2-air ... plate with 1 cm pitch, 1 mm hole, and partitioned calming section. Chemical Engineering Division, School of Mechanical and Building Sciences, Vellore Institute of Technology, Vellore, India. 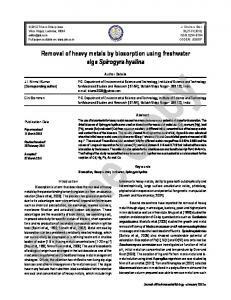 Abstract : Our work aims to throw light on biosorption of heavy metals in a Liquid Solid Fluidized Bed as a successful alternative for heavy metal removal. The design and fabrication of LSFB has been discussed. 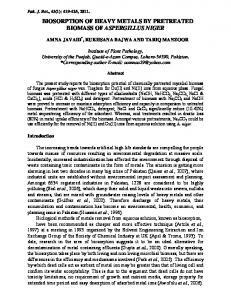 Batch studies and fluidized bed studies were carried out to study the biosorption behavior for chromium, nickel, copper and cadmium by alginate beads containing a mixed consortium of Yeast, Pseudomonas aeruginosa, Bacillus subtilis and Escherichia coli. Fluidized bed studies were carried out in 1m length and 5cm diameter column, with an optimized adsorbent dosage of 1g/L, a flowrate of 132 LPH, a bed height of length of the reactor. Efficiency of biosorption for copper, cadmium, chromium and nickel in LSFB was found to be 84.62%, 67.17%, 49.25% and 61.02%. The efficiencies were found to depend on the pH, temperature, initial metal concentration, and the residence time of the beads in the fluidized beds. 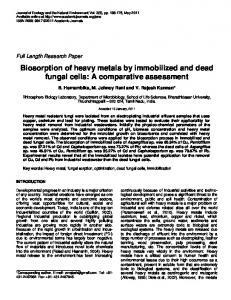 Desorption of the exhausted beads was successful, however, with a reduced biosorption capacity. 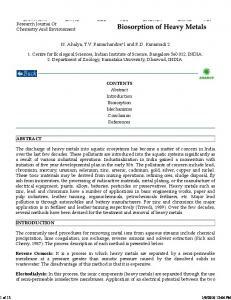 Pretreatment of the culture was found to increase the capacity of metal uptake. 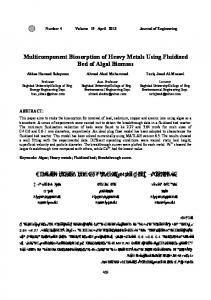 Keywords: Liquid Solid Fluidized bed; Immobilization; Heavy metals; Biosorption; Desorption. Introduction One of the most challenging environmental problems is the removal of heavy metals and other toxic contaminants from industrial wastewater. Of the important metals, Mercury, lead, cadmium, Arsenic and Chromium (VI) are regarded as toxic; whereas, others such as copper, nickel, cobalt and zinc are not as toxic, but their extensive usage and increasing levels in the environment are of serious concerns [1,2,3]. Several methods are being used for the removal of heavy metals ions from aqueous wastes (Chemical Precipitation, Ion Exchange, Electrochemical Treatment, Membrane Technologies, adsorption on activated Carbon. etc. . Each of these methods has its own merits and demerits. 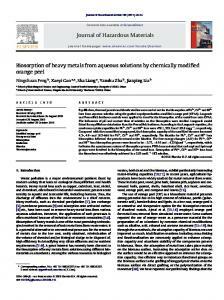 But the search for new eco-friendly and cost-effective technology for the removal of heavy metals from wastewaters has been directed towards biosorption. 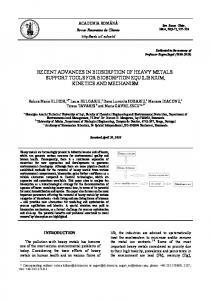 R Ilamathi et al /Int.J. ChemTech Res.2014,6(1),pp 652-662. 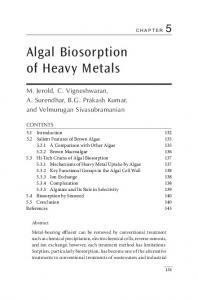 Biosorption using potential metal biosorbents like algae, bacteria, fungi, and yeast can be an effective technique to decrease the concentration of heavy metal ions in solution . 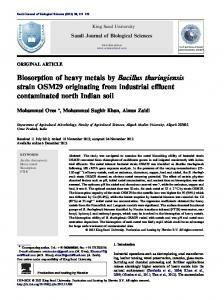 Reduction of hexavalent chromium Cr(VI) to Cr(III) by bacteria such as Pseudomonas aeruginosa , Bacillus sp. and Escherichia coli  is already reported. However, application of free bacterial cells at industrial scale is disadvantageous due to the difficulty of biomass/effluent separation  etc., which may be overcome by using immobilized bacterial cells with the advantages of stability, regeneration, solid–liquid separation and minimal clogging in continuous systems . 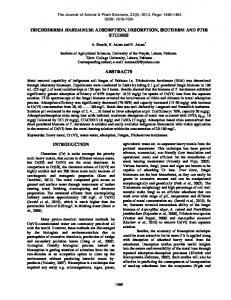 Immobilization of microorganisms in a suitable matrix like polyvinyl alcohol, agar media and sol–gel materials has been proven to be an efficient solution to this problem [11,12]. Adsorption processes are traditionally carried out in fixed beds  due to the high concentration of solids and the obtainable uniform residence time. However since the wastewater to be treated often contains solid impurities leading to a plugging of the fixed bed, the liquid must be clear to avoid column blocking. Recently, many experimental studies have been conducted in fluidized beds, which allow treatment of turbid liquids while avoiding the channeling problems . Fluidized beds are common and important reactors in process engineering because of the good mass and heat transfer rate between the fluid and the particles, and between the particles and the side wall of the column. The term fluidization is used to describe the condition of fully suspended particles. Liquids or gases are passed at certain velocity up through a bed of solid particles, at this velocity the pressure drop across the bed counter balances the force of gravity on the particles and further increase in velocity achieve fluidization at a minimum fluidization velocity. 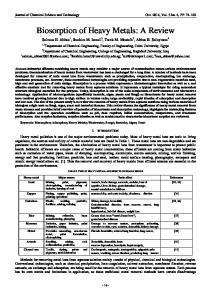 Fluidization quality is closely related to the intrinsic properties of particles, e.g. particle density, particle size and size distribution, and also their surface characteristics . 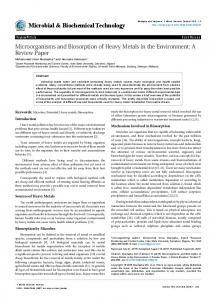 From the previous literature related to the biosorption of heavy metal using bacteria, it can be concluded that there is a lack in literature of using immobilized bacterial consortia in liquid solid fluidized bed to study the behavior of biosorbents and its efficiency in heavy metal adsorption. Hence, this work aims to study the adsorption of heavy metals like chromium, nickel, copper and cadmium in liquid solid fluidized bed using immobilized sol-gels as a solid catalyst containing mixed cultures of Yeast, Pseudomonas aeruginosa, Bacillus subtilis and Escherichia coli. for the inlet. A rotameter of range 0 – 300 LPH was used to vary the flowrate. Immobilized Sodium Alginate beads were selected as the fluidizing particle. The main advantage of using Sodium Alginate is that it doesn’t react with water. Also, it has small diameter and low density, and hence, it is easier for fluidization and entrainment. Another advantage is that it fluidizes at low liquid flowrate. Hydrodynamics studies were carried out on the LSFB using Alginate beads as the fluidizing particle to study its behavior and to check its functioning. Fig. 1 Schematic diagram of the experimental setup. 2.2.4.4 Selection of fluidizing particle The distributor pore diameter is 1.5mm. A particle of size smaller than 1.5mm will pass through the distributor or plug the distributor. Hence, the particle size should be greater than 1.5mm. Synthetic waste water was the fluid being used, the fluidizing particle has to have density greater than that of used waste water, failing which, the particles will float and fluidization will not occur. Hence the density of the particle must be greater than 1000kg/m3. Hence, Sodium Alginate beads were selected as the fluidizing particle. The main advantage of using Sodium Alginate is that it doesn’t react with water. Also, it has small diameter and low density, and hence, it is easier for fluidization and entrainment. Another advantage is that it fluidizes at low liquid flowrate. 2.2.4.5 Experimental Procedure The fluidized bed is initially filled with beads up to a 1/4th of the total riser volume. Tap water is pumped from the reservoir into the reactor column using a ½ HP pump. The flowrate of the liquid is measured using a rotameter with a range of 0 to 300 LPH. At each flowrate, the bed height is measured and tabulated. The pressure drop across the column is also measured using a digital manometer and tabulated. The voidage is calculated at minimum fluidization velocity and at different flowrates. The pressure drop across the bed was found to be the same for different flowrates, thus indicating the proper construction of the LSFB. 2.2.4.6 Hydrodynamics of LSFB Hydrodynamics studies were carried out on the LSFB using Alginate beads as the fluidizing particle to study its behavior and to check its functioning. The effect of flowarte was analyzed with pressure drop, bed height and voidage to ensure the proper construction and fabrication of Liquid Solid Fluidized Bed. Where Q is the metal uptake (mg metal per g biosorbent), v the liquid sample volume (ml), Ci the initial concentration of the metal in the solution (mg/L), Cf the final (equilibrium) concentration of the metal in the solution (mg/L) and m the amount of the added immobilized biosorbent on the dry basis (mg). 2.2.7 Desorption studies The exhausted Alginate beads containing immobilized microorganisms after heavy metal biosorption were removed from the LSFB. The beads were then treated with 0.1 N Nitric Acid, and allowed to stay for an hour and loaded back into the LSFB.10 ml of samples were withdrawn every half hour. 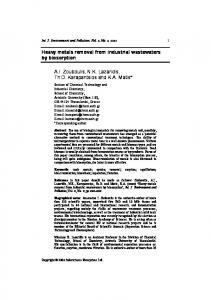 The samples were then analyzed in the Atomic Absorption Spectrophotometer to determine the heavy metal concentration. 2.2.8 Pretreatment Studies For pretreatment, 0.1 N NaOH was prepared and poured into the mixed culture in the ratio 1:2. The mixture of culture and alkali were placed on the shaker incubator at 150 rpm and 35oC. After an hour, the culture is mixed with Sodium Alginate and immobilized beads are made. These beads form the pretreated beads. The beads are then loaded in the LSFB. Synthetic wastewater is prepared by making 30 liters of 70 ppm heavy metal solution in the feed tank. The pump is switched on and the flowrate is set to an optimum of 132 LPH as determined by the hydrodynamic studies in the column. 10 ml of samples are withdrawn every half hour. The samples are then analyzed in the Atomic Absorption Spectrophotometer to determine the heavy metal concentration. 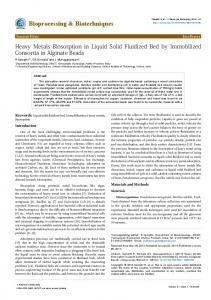 Report "Heavy Metals Biosorption in Liquid Solid Fluidized Bed by"